The remarkably flexible E shape of the CAGED system. This is also generally referred to as Box 1 and Pattern 1. Please note the positions of the root notes. This is very important to commit to memory. 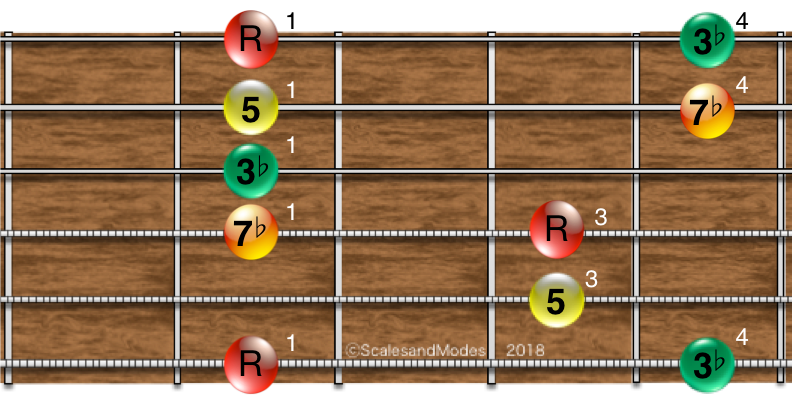 Please take the time to note the E Major bar chord shape within the scale. Notes of Major Arpeggio are the 1st (root), 3rd, and 5th of the Major scale. Please take note of root note positions to help you recognize the E-Shape of the CAGED system. This is the same as the natural Major scale. This mode includes a flat 3rd and flat 7th scale tone. 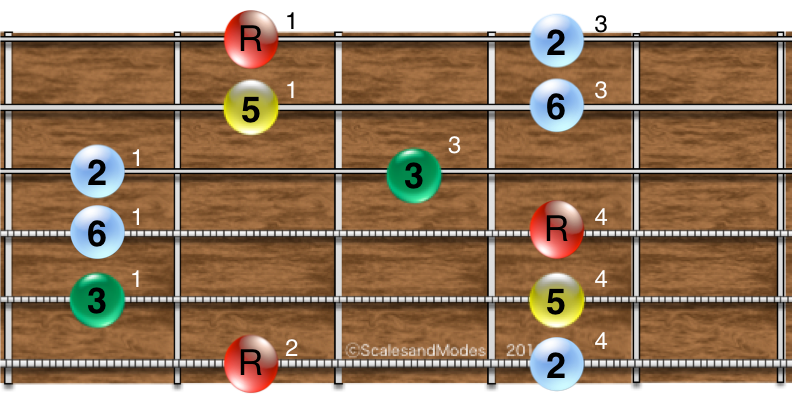 This mode includes a flat 2nd, flat 3rd, flat 6th, and flat 7th scale tone. This mode includes a sharp 4th scale tone. This mode includes a flat 7th scale tone. 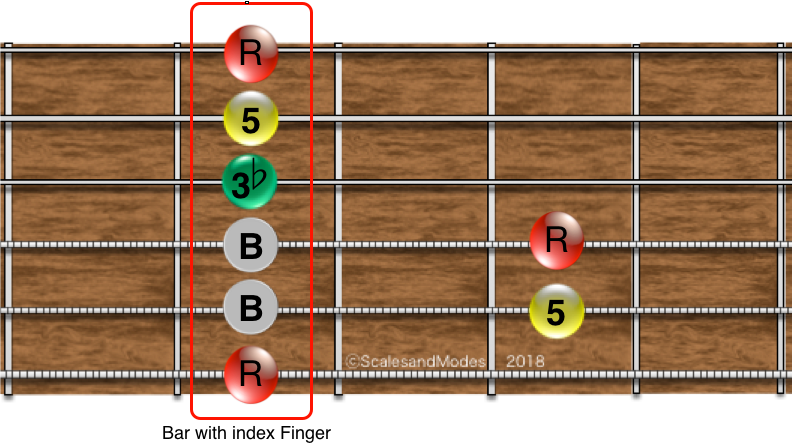 This mode includes a flat 3rd, flat 6th, and flat 7th scale tone. 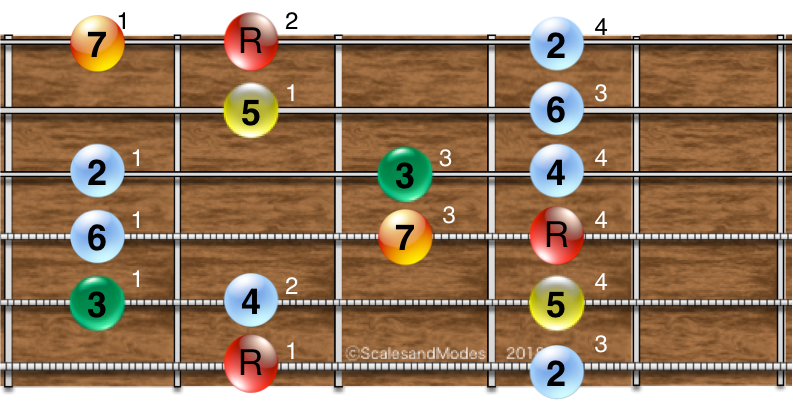 This mode includes a flat 2nd, a flat 3rd, flat 5th, flat 6th and flat 7th scale tone. Please note position of the root notes. The Major pentatonic scale utilizes the 1st, 2nd, 3rd, 5th, and 6th degrees of the Major scale. 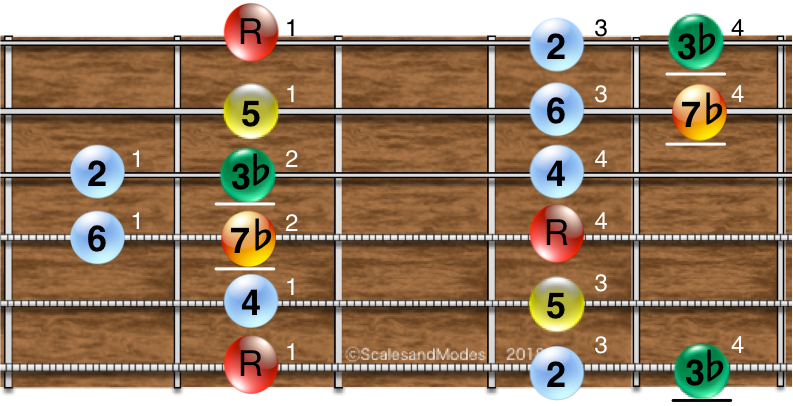 The 4th and 7th tones are dropped to produce the 5 note pentatonic scale. The Major pentatonic blues scale add the flat 3rd to the Major pentatonic scale. Please note the positions of the root notes. 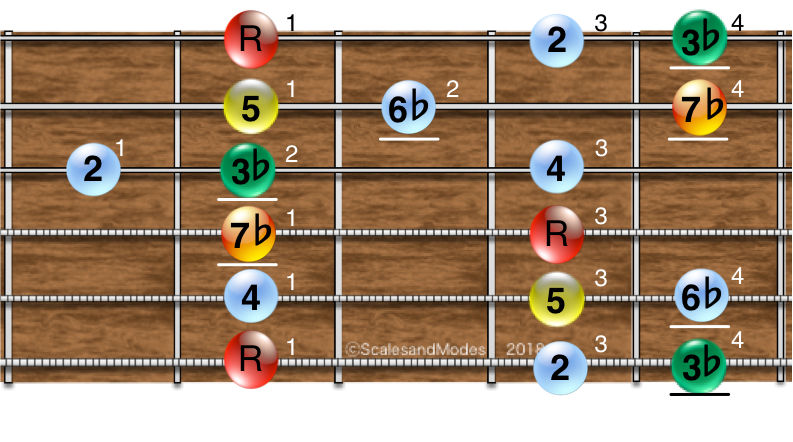 Only change from Major scale bar chord is the flatted 3rd of the scale. 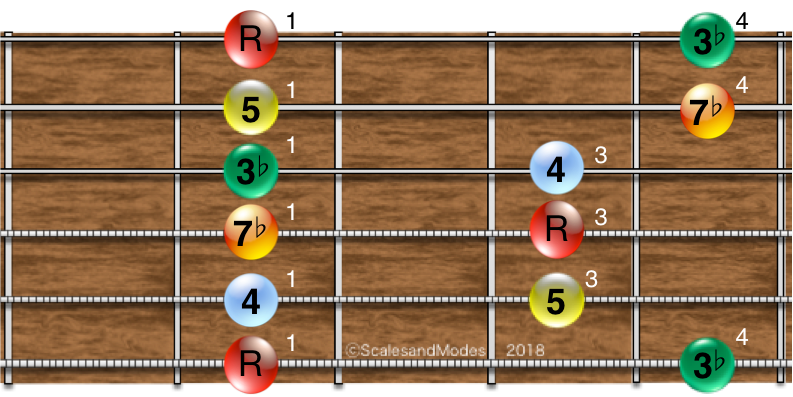 Please take the time to note the E minor bar chord shape within the scale. 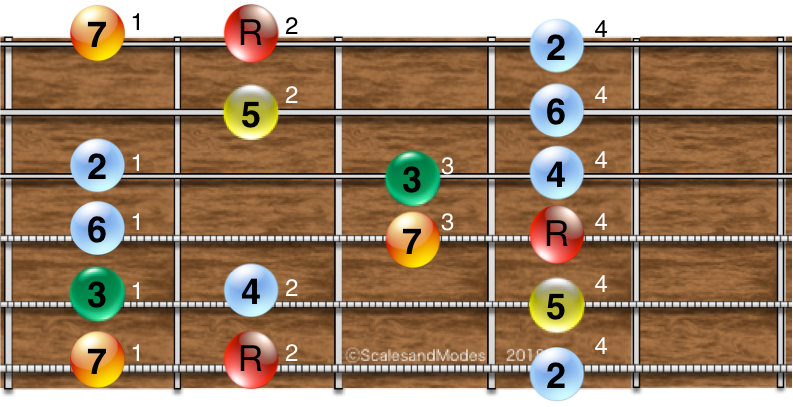 Notes of minor arpeggio are the 1st (root), flat 3rd, 5th, and flat 7th of the minor scale. Please take note of root note positions to help you recognize the E-Shape of the CAGED system. 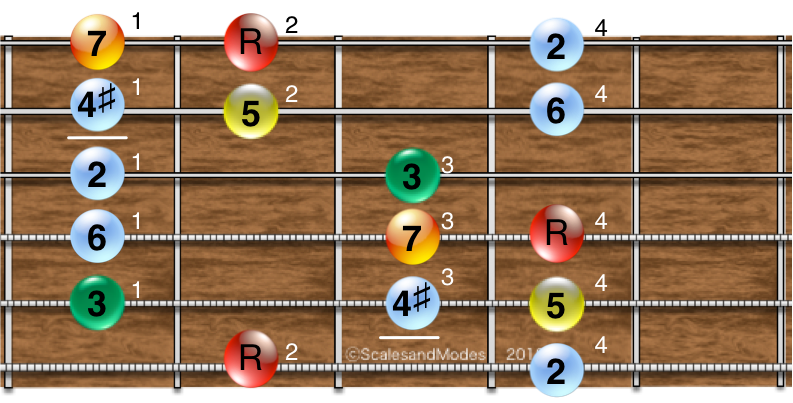 Minor pentatonic scale utilizes the 1st, flat 3rd, 4th, 5th, and flat 7th tones of the Major scale. 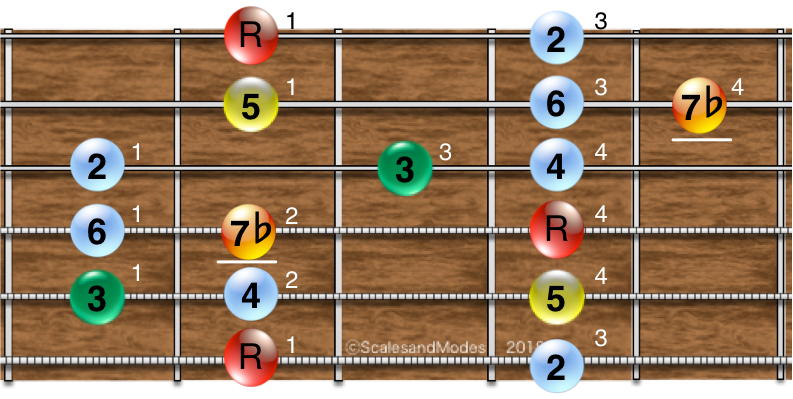 Please take the time to note the E minor bar chord shape within the scale. 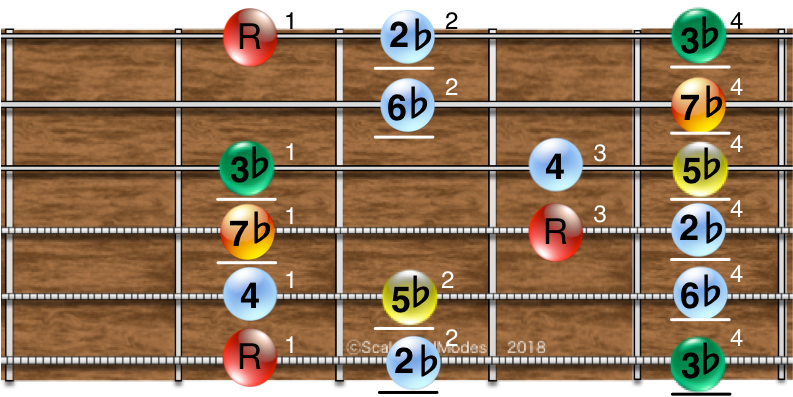 The minor pentatonic blues scale add a flat 5th to the notes of the minor pentatonic scale.